« Might Petra be the ‘place in the wilderness’ where Philadelphian Christians may be protected? French President Emmanuel Macron has warned that “there seems to be a European civil war” between liberal democracy and rising authoritarianism. He urged the EU to renew its commitment to democracy, in a passionate speech to the European Parliament in Strasbourg. “I don’t want to belong to a generation of sleepwalkers that has forgotten its own past”, he said, recalling how the EU arose after World War Two. He is launching debates with voters, aimed at re-engaging them with the EU. In his speech he condemned what he called “a fascination with the illiberal” in Europe. 17 April 2018France’s president Emmanuel Macron urged reforms to address concerns and fears of EU citizens in a speech aimed at boosting the EU unity amidst a string of crisis. Speaking to EU lawmakers in Strasbourg on Tuesday, he urged the deputies to create a “proper debate on convictions and proposals” and make the “EU democracy come alive” as the bloc starts its preparations for the May 2019 vote. The upcoming parliamentary vote is the first EU-wide election since the UK voted to leave the union. European people “have not given up on Europe,” Macron said in an emotionally charged address on Tuesday. 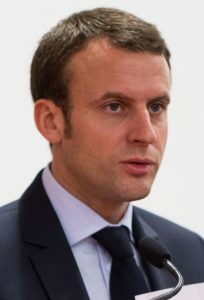 The French leader called for a debate on migration, a roadmap to eurozone reform, reforming the banking system, and a EU-wide sovereignty which would compliment the sovereignty of individual member states. So, France’s President is concerned that there is a type of civil war in Europe between those that favor democracy and those that favor authoritarian rule. He also wants more European unity, European-wide sovereignty, and a stronger European military. The “Great Sea” that bordered the ancient lands of Israel (Numbers 34:6-7; Joshua 1:4; 9:1; 23:4; Ezekiel 47:13-16) is the Mediterranean Sea–and that is the sea that Daniel was referring to. 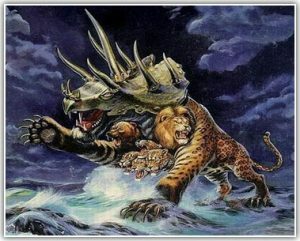 Despite some false claims by some, the Beast power is not a nation like Russia, which does not border the Mediterranean Sea, but Europe which does (Russia, however, will be a factor in eliminating the European beast power, see also The Eurasian Union, the Kings of the East, and Bible Prophecy). A comparison of the beasts in Revelation 13 and Daniel 7 shows that they share many of the same characteristics (for some details, you may wish to watch the YouTube video Can You Prove that the Beast to Come is European?). Europe is the power that will control the “Great Sea.” And while the southern border of the Mediterranean Sea is currently under Arab control, the Bible shows that the King of the North will take over the Arab powers (Daniel 11:40-43; Ezekiel 30:1-9). These ten kings have no kingdom, but are to obtain one. Thus, this is a type of reorganization in verse 12. Since they give their power to the Beast in verse 13, this is a second reorganization. The “beast” is not shown to have much power prior to Revelation 17:12-13. This turnover of power to him results in a dictatorship (see also Must the Ten Kings of Revelation 17:12 Rule over Ten Currently Existing Nations? )–which will be worse than, but similar to, the one led by Adolf Hitler (see also European Unity to be like Hitler?). Emmanuel Macron is to receive the Charlemagne Prize for promoting European unity (see France’s President Macron to receive the Charlemagne Prize: Any relationship between Charlemagne and the Beast of Revelation?) on May 10th of this year. He wants a stronger Europe, but prefers a democratic one. While Europe may temporarily end up with a little more democracy, the prophetic reality is that Europe will turn into a dictatorship (Daniel 11:36-38). Europe will end up with a stronger military and a “great army” (Daniel 11:25). So, President Macron will get some of what he wanted. But Europe will end up with the Beast, which is something people like Emmanuel Macron have not seriously considered. This entry was posted on Tuesday, April 17th, 2018 at 7:00 am	and is filed under Prophecy.